Reserve your airport parking at Belfast International Airport (airport code BFS) in advance and keep your stress level down for your next trip! There is one Belfast airport parking lot, so it really does pay to book in advance – especially during busy travel periods. The lot is at the “Killead Lodge” and is off-airport about a half-mile from the airport, but there are transfer shuttles which run 24 hours a day and take only five minutes to get from the parking lot to the terminal. Belfast International Airport is one of two airports in the city, but it is the major international airport. It is about 21 km from the city center. This is a major city on the route networks of both easyJet and Jet2.com, and Aer Lingus opened a base in Belfast in late 2007. Belfast’s airport is also sometimes known as Aldergrove, because that is the name of the town which lies closest to the airport itself. 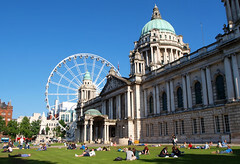 The other local airport is George Best Belfast City Airport (airport code BHD), which is closer to the city of Belfast and mainly serves the domestic market. For traffic information, see TrafficWatch Northern Ireland here. Taxi: The International Airport Taxi Company is the official Belfast airport taxi operator, and the taxi queue is outside the right hand door of the airport exit lobby. The fare from downtown Belfast to the airport is roughly £25. Rail: The nearest rail station to the airport is six miles away in Antrim, from which you would need to catch a taxi to the airport. Bus/Shuttle: There are bus services which run between the airport and both Londonderry and Belfast. The bus from Londonderry is the Airporter and runs hourly, and the bus from Belfast is the Airport Express 300 and runs every 10 minutes 24 hours a day.